As I mentioned before, watch market is highly dominated by men's models. I am not saying ladies watches are totally unheeded. What I am trying to say is most of the Hi-End watch making tricks are packed in men's models. 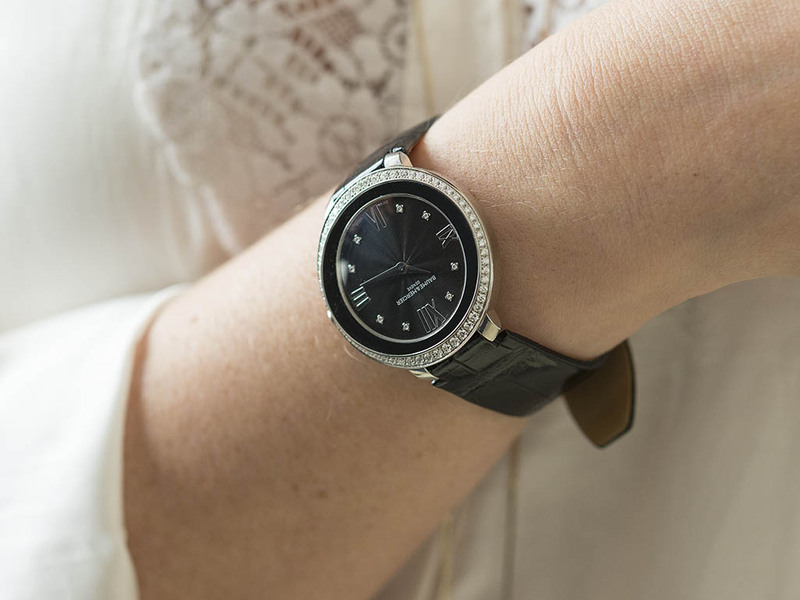 On the other hand, one of the backbones of the accessories market - ladies watches are offered with fashion oriented designs and tempting looks by the use of precious metals and diamonds. Though not as drastically as America ( and Europe partially ), the trend is followed by the women in Turkey as well. Frankly speaking, I am not a big fan of ladies wearing men's watches. In fact, I believe that the ideal watch size for women varies between 26mm to 36mm in diameter. At this point, I searched for the alternatives regarding a men and women watch set which will differ in gender at the first sight with their masculine and feminine manners but also feature modern and up to date specifications as well. Not to mention they got to be a perfect match for each other. 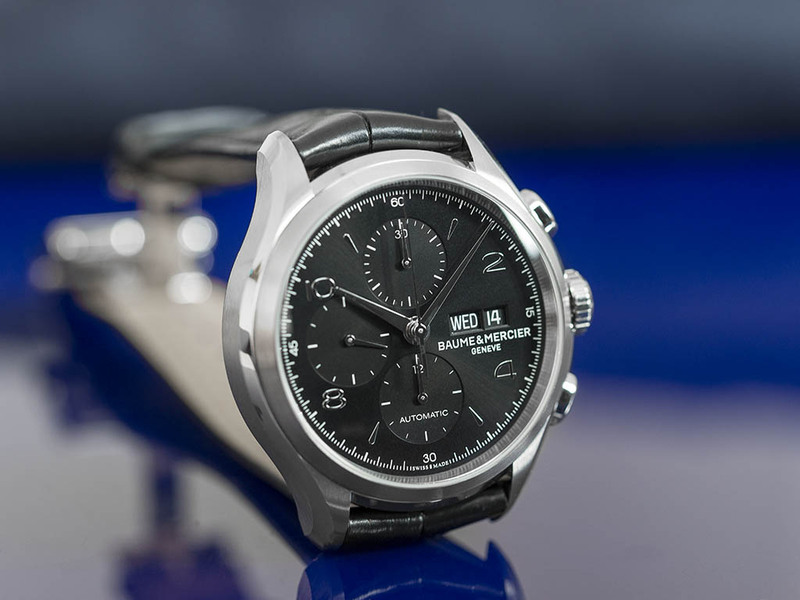 In this regard, my favorite duo comes from one of my favorite brands specializing in combining traditional values with todays modern designs; Baume Et Mercier. Clifton is one of the successful series out of the brand which combines a classic looks and a sporty character in a stunningly retro looking case designed in 50s Golden Era style. With it's broad hands set design and clean dial, Clifton Chronograph is surely a handsome watch while 43mm diameter case is modern enough to give a bold wrist presence. The case is made of stainless steel. Combining satin brushed and mirror polished surfaces, undoubtedly the most eye catcher part of the case is it's lugs tributing to the 50s glamour designs. The thick and plain bezel boosts the mighty presence of the watch. Please note that, the thickness is remarkable at 14.95mm due to the Valjoux 7750 based automatic chronograph caliber. Clifton Chronograph sports both sapphire crystals front and back. 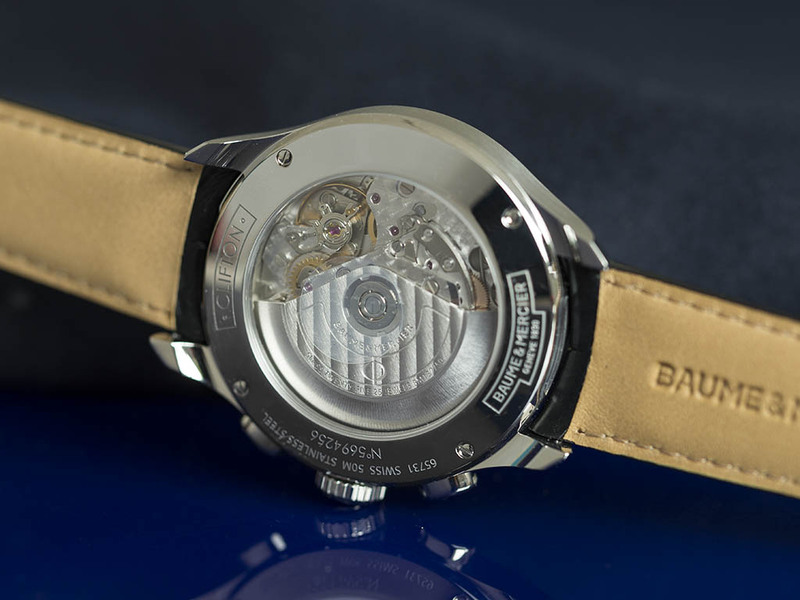 The caliber can be seen through the transparent case back. The crown is designed in a nice and matching form with the rest of the watch. It is easy to operate with solid feeling. I liked the chronograph pushers a lot. They have an elliptical form with satin brushed tops which supports the retro look stunningly. The watch is WR50M rated. 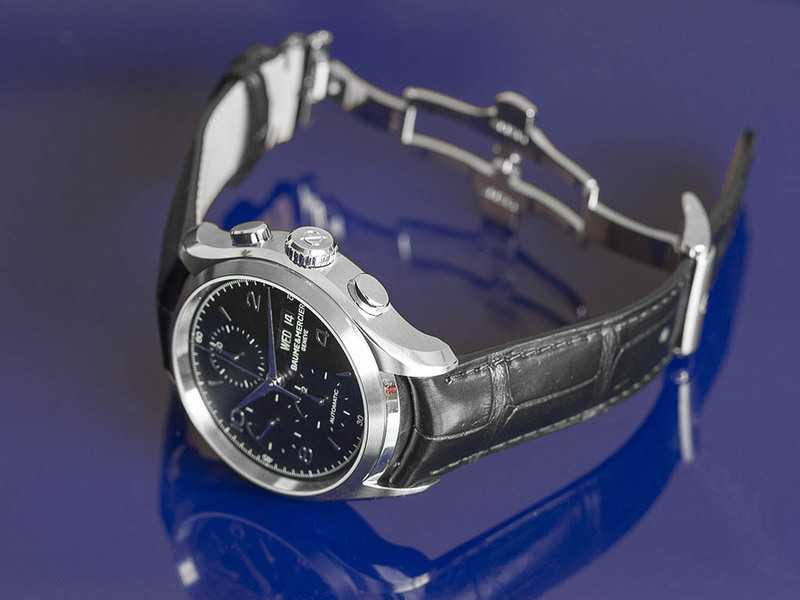 The automatic chronograph caliber is based on Valjoux 7750. 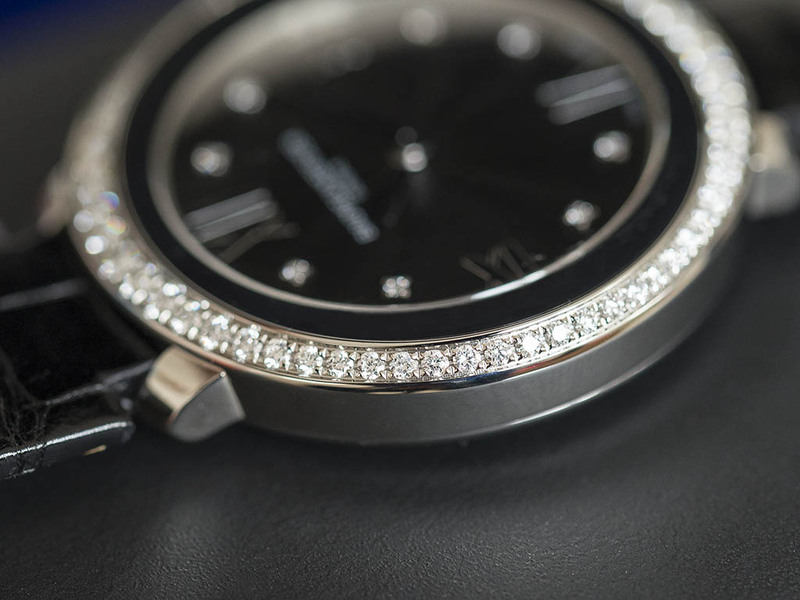 25 jewelled caliber offers 48h power reserve when fully wound. 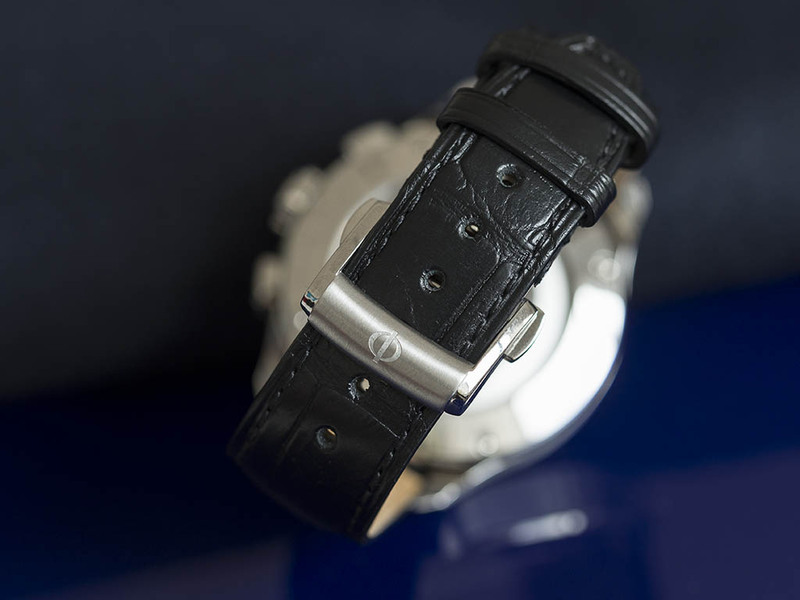 Clifton Chronograph comes on a nice black crocodile strap which balances the weight of the mighty case perfectly. 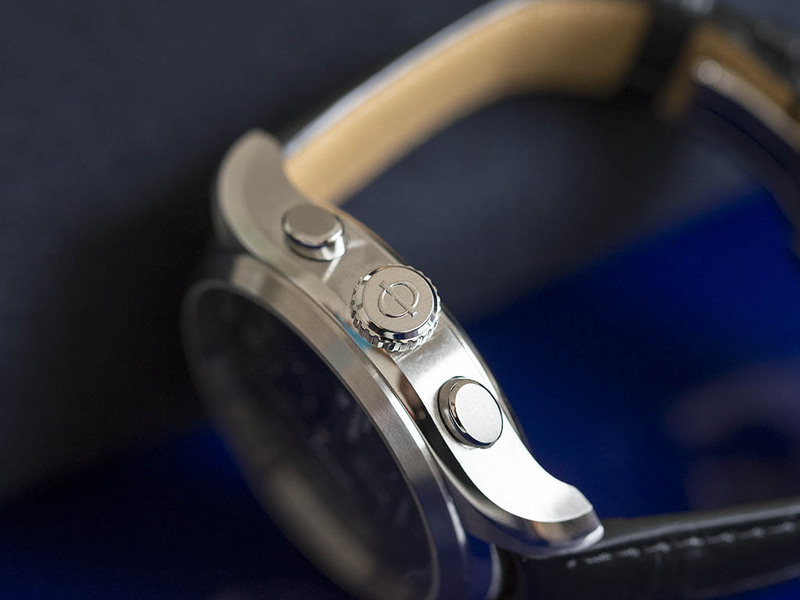 The stainless steel folding clasp with Baume Et Mercier logo engraving looks quite neat. Despite it's big and hefty case, Clifton Chronograph is still a comfortable watch. I strongly suggest the watch to the watch aficionados looking for a classy dress chronograph with retro looks and a nicely balanced modern size. I might say that, the Promesse series is one of the best examples of the brand's success in combining classic and modern. 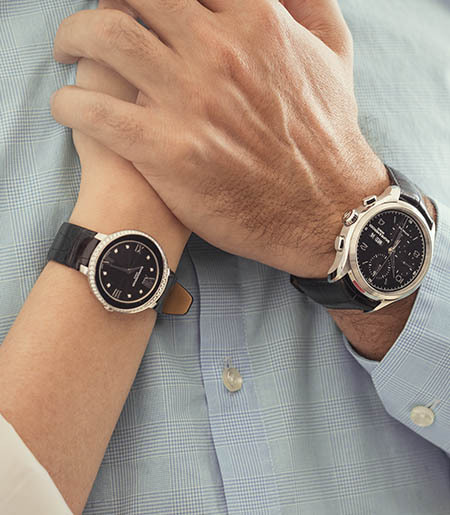 With it's 34mm diameter stainless steel case, Promesse combines the best of both classic and modern in size. The stunning dial features Drapé style among another Swiss watch making classic; Guilloché form. There are two different points where the watch blends it's traditional looks with modern lines; The black dominated design and the use of stylized Roman numeric index. Those two features, combining the traditional character successfully, prevent the Promesse to be a simple classic watch. 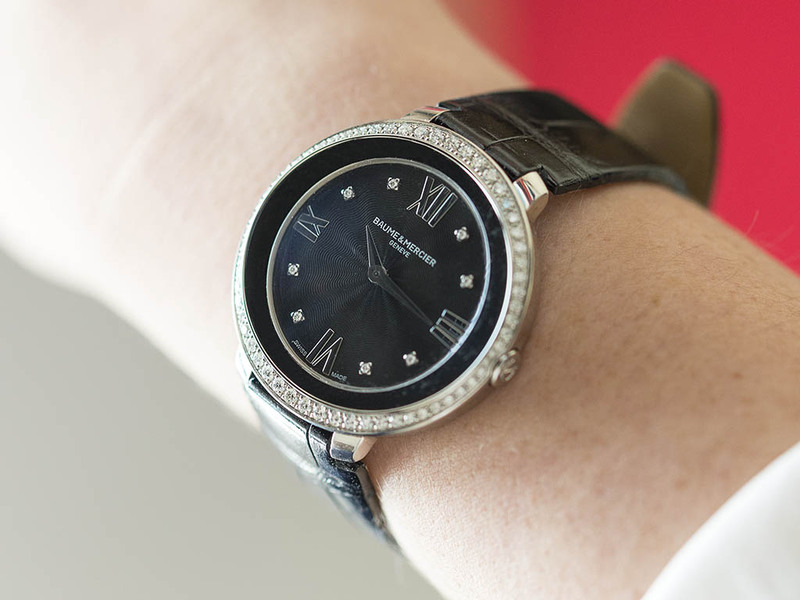 Undoubtedly, one of the most striking parts of Promesse is the diamond decoration on it's bezel and dial. 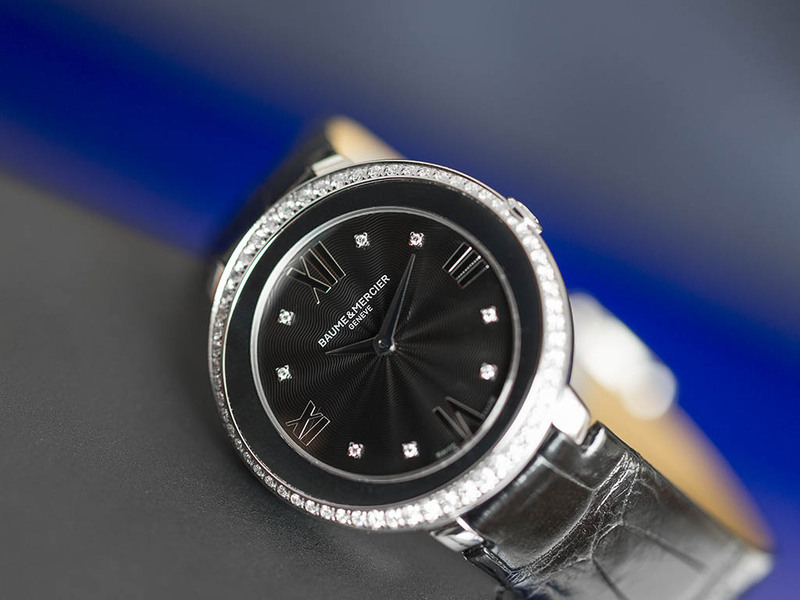 Featuring 61 pieces of diamonds, Promesse glows like a charm thanks to it's black Drape dial creating a depth look. 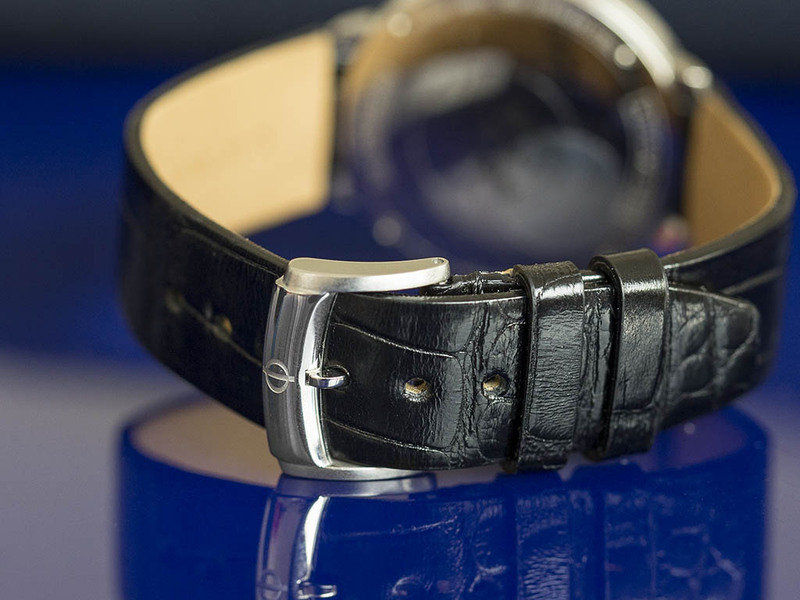 The watch comes on a black crocodile strap which suits nicely with the black dial. The classically designed thumbnail buckle looks good and operates securely. Promesse is one good alternative for the ladies who look for simple but elegant designs and a nicely balanced touch of diamonds.